We won! The streak is dead! Let there be a grand clubhouse feast! Bring out the finest meats and cheeses in all the land! Delgado actually got a win to break the streak. I am just as floored as you are. Short of Mike Minor, I can't think of a more unlikely character to get us off the shnide, so good for Randall. The key was getting first blood with a homer in the 1st inning by Bourn, and then taking a bigger lead with the 2-out-3-run jack by Uggs in the 3rd inning. The hilarious part of this win was that we got 5 runs on 5 hits, while the Cards got 10 hits but only 4 runs. Yadier Molina had a field day yesterday in the loss. He went 4/4 with 3 RBIs and a homer. You can't really hit much better than that in a game, but he was the only Cardinal doing any real damage. Furcal went 0/5 in the leadoff spot, which is always a big key to our success. Keeping him off the basepaths keeps the chaos to a minimum. I'm starting to like how Durbin is pitching, even though I know he's had issues. I feel a little more comfortable with him than I do with Venters right now, shocking as that is mentally. EOF is also starting to round back into shape with a solid 8th inning last night. Kimbrel is still the absolute shutdown force he's always been. With the game on the line, there's nobody better in the majors in my humble opinion. The MVP of the game has to be Dan the Man Uggla. That 3 run shot in the 3rd caused a collective sigh of relief in the dugout. The weights were lifted from Delgado's shoulders and placed squarely on the Cardinals. Suddenly, we felt as if we were going to win for the first time in weeks. Add in the fact he also coaxed 2 walks in addition to his homer, and you have a very solid .750 OBP for the day. Good stuff, Danny boy. Keep up your slugging ways tonight against the Cards so we can win this series! Oh yeah, that's right. We have a chance to win a series. It's been a while hasn't it? With Huddy on the mound tonight I always feel good about our chances, even if it is against Kyle Lohse. His name sounds like some sort of moisturizer. New from Gilette: Lohse for men, won't dry our your skin! Well I'll be damned if we're going to drop a game to some fancypants ivory liquid nancyboy! So what if he's 5-1 with an ERA under 3? Uggla, Heyward, and Prado have all smacked him around before, and they are going to step up again tonight! 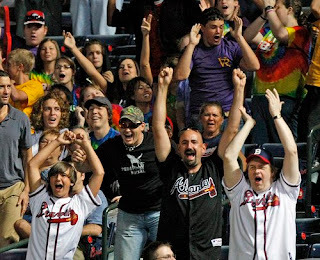 Braves @ Rockies: Game 1 Recap aka "Deja Vu"
Phillies @ Braves: Game 2 Recap aka "The Epic"